Adel, you had been working with expats through BNP Paribas for years. Why did you launch a new expat brand last year? BNP Paribas Personal Investors has always done some business with expats. In recent years, we saw a growing demand from expatriates who considered Luxembourg as an interesting financial centre, so we wanted to profit from this and get ahead in people’s minds quickly. Since we wanted to position ourselves strongly within the expatriate community we believed that we needed a strong brand. The idea came up in a small brainstorming session at the end of 2009. First, we checked the domain–surprisingly it was still available. Next, we registered “The Bank for Expats” as a European brand. The brand has a few obvious advantages. It’s great for SEO, of course, and it also suggests that there can only be one. Some of our competitors have told us that they should have thought of this one too (laughs). We also bought the domain in various other languages, but these haven’t been used yet. In the beginning we wanted to build the brand in French, but when we developed the logo we thought this was actually strong enough in English. The stamp in the logo is supposed to communicate authority and power. Talking about the logo, how did you develop the design of the site? We wanted to create an upscale environment, so we tried to reproduce a wooden desk in the background. The idea for the passport campaign came from a direct mailing where we sent out fake passports to customers. The response was huge–so we re-used the idea here. The moving guy in the passport represents the emotions an expat goes through. How did you push the new brand into the market? We spent about 95% of our advertising online, the rest was a little bit of PR and some ads in a few select French newspapers. On the web, we used search marketing, direct mailings and campaigns on some of the major expat websites. Do you see any difference in conversion, for example between English and French leads? We clearly see a better conversion among people who have been exposed to the BNP Paribas brand before, for example the French, Belgians and Italians. This means that the brand is quite important for expat customers. On the only English expat site we ran a campaign on, we saw a huge amount of clicks but almost no conversion. You have just changed agencies and are now developing the strategy for your new campaign. Can you give us a preview of what you’re trying to do? We have chosen a new agency for our new campaign’s approach. On our website, we want to optimize the content and increase our coverage of expat topics. We are also looking into new ways of pushing the brand externally. Are you going to expand into more languages, like Italian? Yes, we could look into advertising in Italian or even German but the problem is that it takes a lot of time to identify the right websites. You have a few big expat sites, but then you also have a lot of small ones that create a lot of work. Right now, I wouldn’t even know where to start with for Italian or German sites. When is your new campaign going live? (Laughs) I’m an optimistic guy, so I hope we have some clarity by September. However, we want to rethink parts of our strategy to see where we can generate more qualified leads. And as you know, time flies. 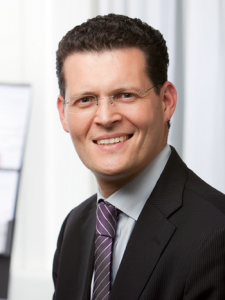 Adel Nabhan started his career in the marketing & communications department of Dexia in Luxembourg. In 2007, he joined Cortal Consors Luxembourg, an entity of the BNP Paribas Group that he rebranded into BNP Paribas Personal Investors in 2009. As Director for Marketing, Communication and Strategy, Adel developed the marketing strategy for BNP Paribas Personal Investors’ expat segment branded “The Bank For Expats”. Posted in Expat Campaigns.Tagged expat banking, expat branding, expat pr, Interview, offshore banking. 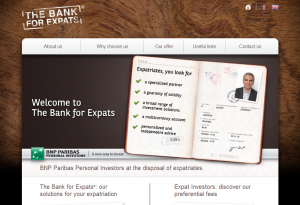 Bank for expats is actually a very nice idea, I feels in the need of it for sometime.